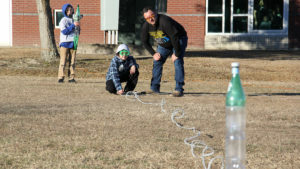 Bottle rockets soaring through the sky mean more than just Saturday afternoon fun for many children across North Carolina. Thanks to the state’s Science Olympiad program, a partnership with NC State, activities like this become the start of a lifelong love of STEM learning. The competition’s backyard-friendly activities give elementary through high school students an experiential education through hands-on skill development and problem-solving. St. Andrews Presbyterian College in Laurinburg, N.C., hosted the nation’s first recorded Science Olympiad event in 1974. Today, each state hosts competitions consisting of a series of inquiry-based events integrating biology, earth science, environmental science, chemistry, physics, engineering and technology. NC State houses North Carolina’s Science Olympiad program, and for good reason. 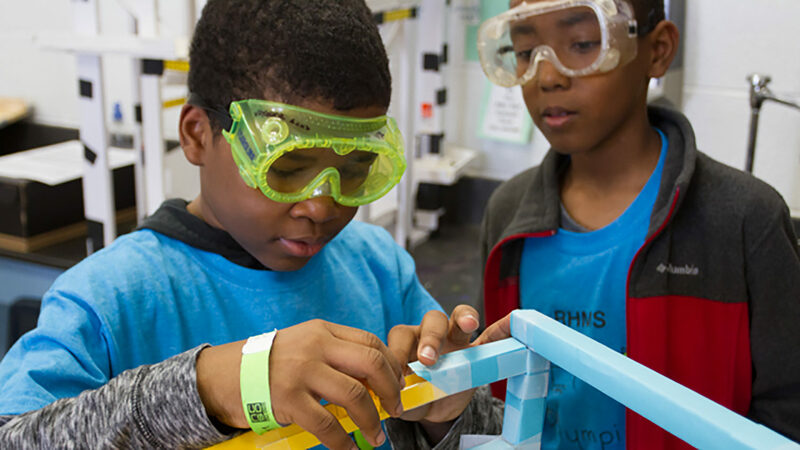 At the elementary school level, Science Olympiad aligns with the North Carolina Standard Course of Study, supporting teachers’ current classroom curricula. Events balance the various science disciplines and require knowledge of science facts, concepts, processes, skills and applications. One such event, Super Sleuths, challenges students to solve a crime using basic forensics skills, testing powders, identifying fibers under a microscope and matching footprints to suspects. Another event, Pro Gamers, gives participants a chance to program video games. The 2020 Science Olympiad National Tournament will be held May 13-16, 2020, on campus. 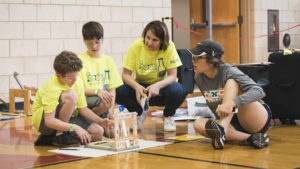 Early involvement encourages students to stick with Science Olympiad throughout middle and high school, where teams that medal in regional competitions move on to the state competition. These events, while more advanced than elementary school events, present the same opportunities for teamwork and creative problem-solving. The Traj-egg-tory event challenges students to build a device to protect an egg dropped from a meter off the ground. Teams with uncracked eggs remain in contention, and the lightest device from among those wins. The winning often takes a backseat in importance to experience gained, though. Exposure to concepts like projectile motion, forces and parabolas ignites a passion for STEM and the realization of previously hidden academic and interpersonal talents. Other NC State faculty, staff and students involved in coaching and mentoring Science Olympiad teams will also tell you that anyone with a curiosity for how the world works can experience STEM learning success. They can also speak from personal experience — more than 1,100 current NC State students participated in Science Olympiad in elementary, middle or high school. In some cases, their Science Olympiad experience is what brought them to NC State. Ashwin Ghadiyaram, a senior biological sciences major, competed in the state Science Olympiad event for seven years. He knew he wanted to give back to the program that had enriched his love of science and inspired him to attend NC State, so he began volunteering with the program. Student volunteers like Ghadiyaram, Yun, Wenger and others provide countless hours of their time to inspire Science Olympiad participants. They balance their involvement with demanding academic careers to help students gain the same type of experience they had in the competition. The results speak for themselves, with many NC State student-coached teams advancing to the state Science Olympiad tournament. The state tournament, which takes place in April each year, brings more than 2,200 middle and high school students who have placed in the 13 regional tournaments to campus. On Friday during the tournament, faculty get a chance to showcase their research and labs to students. This NC State connection has created a program strong enough to bring the national Science Olympiad program to campus in 2020. Preparations are well underway for the event that will likely impact many more future NC State students. Want to see Science Olympiad participants in action? Come to the North Carolina 2018 State Science Olympiad Tournament, April 20-21, hosted on campus. Learn more about volunteering at the local or state level today! Very informative! Our future young generation creating a smarter, cleaner and safer world!